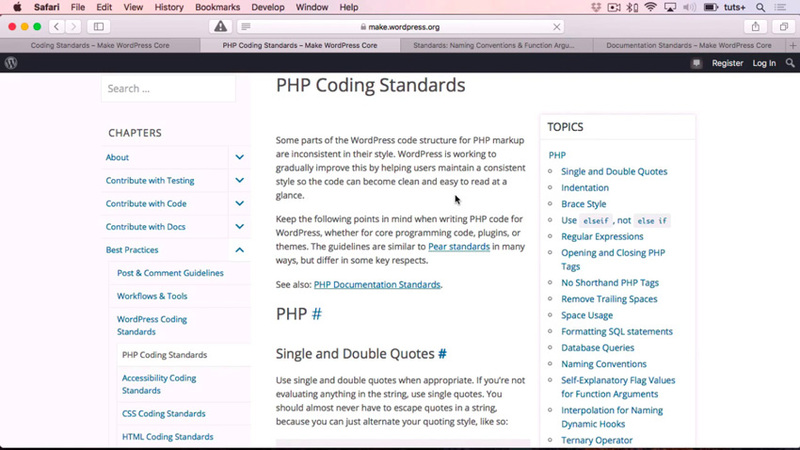 What are the WordPress PHP coding standards? 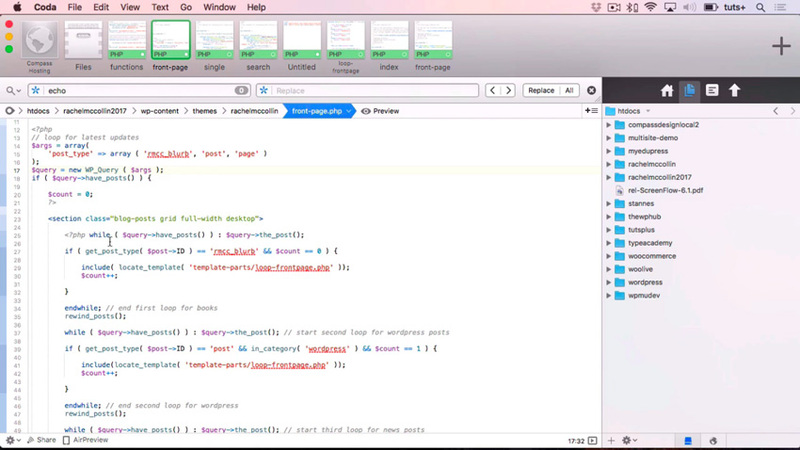 In this video from my course, Learn PHP for WordPress, you’ll learn all about the coding standards and why they’re important. They’re essentially a set of best practices on how to use PHP in WordPress. We’ll go through some examples of what that means in practice in the rest of this tutorial. As you can see, there are standards not only for PHP but also for accessibility and for the other languages that you’d use within WordPress. The second, which is about consistency, is equally important. It’s very likely that you’re going to be working with other people’s code from time to time. 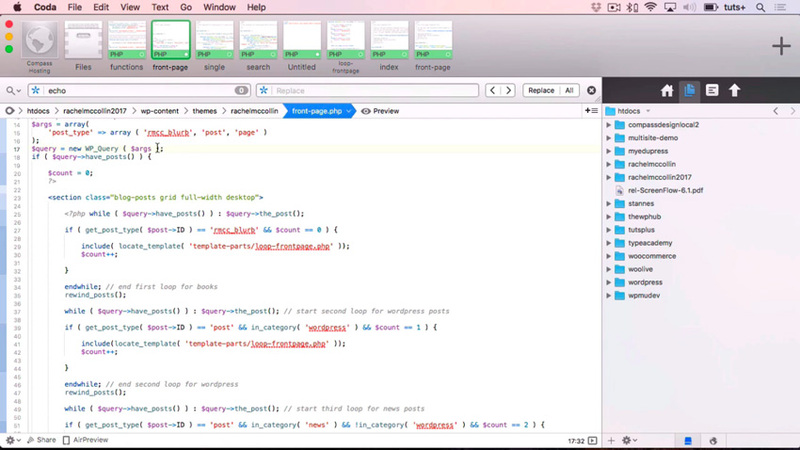 For example, if you’re creating a child theme, you might have to copy some of the code from the parent theme. And if you’re creating a plugin, that plugin could be a fork of an existing third-party plugin that you’re copying and adding extra functionality to. It’s really important that the way you code is consistent with the way that everybody else who codes PHP for WordPress writes code themselves. So let’s take a look at some of the PHP coding standards. And I’m going to show you examples of these in some of the files in my theme. So let’s start with functions. Here’s the functions.php file in my theme as an example. You can see that I’ve got a function that I’ve defined called rachelmcc_register_widgets. That’s all written in lower case, and I’m using underscores between the words, which is how you should always write a function in WordPress. As you’ll also see, I’ve used a prefix. That’s to ensure that this function doesn’t clash with any other functions that might be provided by my theme or by another plugin. So if I wrote a function that was just called register_widgets and one of my plugins also had a function called register_widgets, the two of them could clash. You might find that one of them overrides the other or that the plugin doesn’t work. So instead, I’m using a unique function that’s relevant to my theme. My theme is called rachelmccollin, so my functions have rachelmcc as a prefix. And it’s also important to use underscores for your functions and not to use hyphens. You do use hyphens in two places. Firstly, you use hyphens when you’re defining CSS classes. So you can see that within my widgets, I’m defining CSS classes for my h3 element and also for the id of that widget area. And here, you use hyphens. You should always use hyphens in your file names within your themes and your plugins; don’t use underscores. So here there is a call using locate_template. And loop-frontpage.php is a file, a template part that I’m calling, and you can see that that’s got a hyphen and not an underscore. On the other hand, my post type ID, which is a custom post type I’ve registered, uses an underscore: rmcc_blurb. Within this particular file, which is the one I was calling from that previous file, I’ve defined some variables, one called count and one called title. And you can see that I’m using lower case for both of those. And you can see here, I’m using the WP_Query class. So a class has a capital letter after the underscore, as well as at the beginning. So that’s where you use capitalization when you’re defining a class. It helps people working with your code instantly identify that it’s a class and not a function. Now let’s have a look at how you would use single and double quotes in PHP for WordPress. You can use either single quotes or double quotes, depending on which works best for the specific code that you’re working with. I’ve put that within double quotes because the text contains apostrophes. Let me show you how that would work if we did it in single quotes. You need to put a backslash before the apostrophes in order for them to be output correctly within the HTML—otherwise, it’ll give you errors. Now I don’t know about you, but I’d rather just type it normally within double quotes than do all this within single quotes. The other thing you need to remember is that if you need to put quotes within quotes, you either put single quotes within double quotes, or vice versa. It doesn’t matter which way around, but you can’t put single quotes within single quotes or double quotes within double quotes. So here’s an example going back to my functions.php file. Within here I’ve got single quotes for the value of before_widget, and then within that, I’ve got double quotes for the ID and the class of that. I couldn’t use double quotes here and then put double quotes inside it, so that’s why I’m using single quotes there, because it’s better to use double quotes with your CSS. 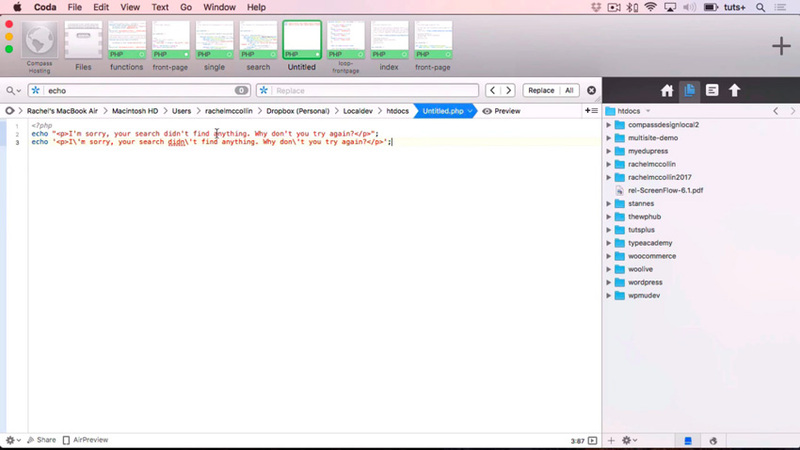 Now, let’s look at indentation. And let’s continue looking at the functions.php file, which is quite a good example because I’ve indented a number of lines of code within it. So each time you’re putting content within braces or curly braces, everything inside that should be indented. And also for indentation, you should use line breaks. So let’s take a look at another file where there are single lines as well as double lines. So here you can see I’ve got an if statement that’s got two lines of code within it. 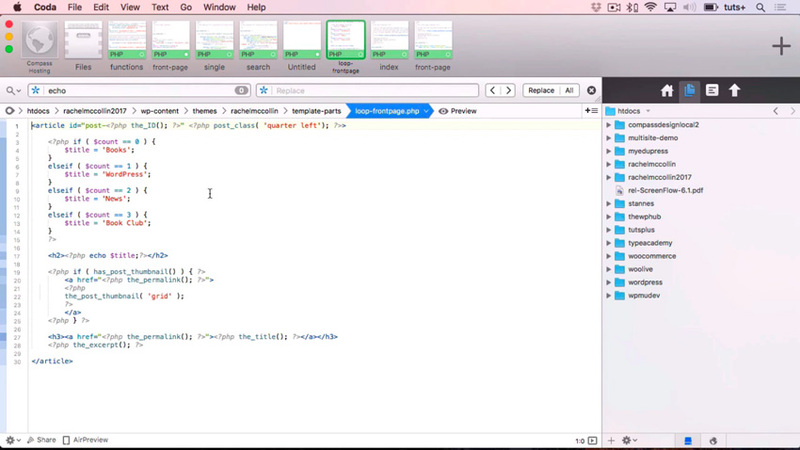 So I’ve put a line break above and below those two lines of code. If there was only one line of code within that, I wouldn’t have to put those line spaces in—I would just put that straight inside my braces. The other thing you need to bear in mind is where you open and close your PHP tag and whether that is on the same line as your code or a different line. And that also depends on whether you’re coding a block of code or a single line. 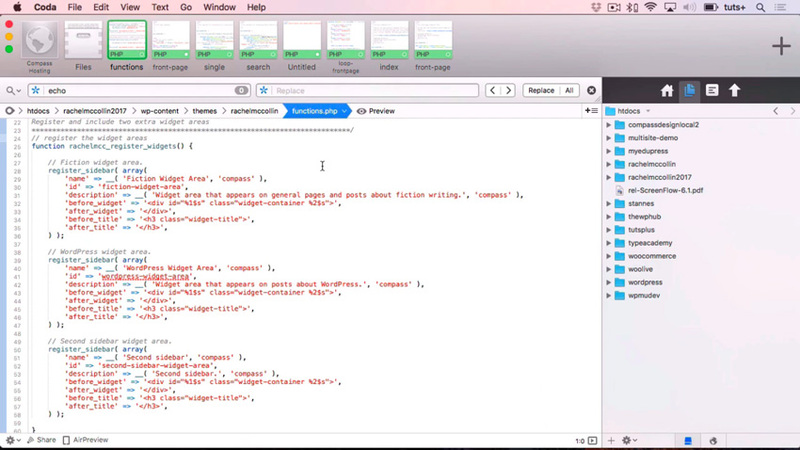 Where you’ve got a block of code, you put your opening tag on one line and your closing tag on another line. That helps to make it obvious that it’s a block of PHP and that everything within those tags is PHP. The other thing you have to make sure you do is use a full opening PHP tag. So don’t just use a question mark, as you might have done in some other systems that use PHP, because in WordPress you have to use the full PHP tag. You can see that we’ve got some PHP that’s all in one line, and then after that I’ve got HTML. So the opening and closing tags go on the same line as my code. That’s an introduction to some of the elements of the WordPress PHP coding standards, and I’ve shown you some examples of them in my files and changed some as I’ve gone along to show you how things are done correctly. If you want to know more about the coding standards, there’s documentation on the WordPress website. And you can also check out this Envato Tuts+ series, which goes into all of the elements of the coding standards in detail. In the full course, Learn PHP for WordPress, you’ll learn all about PHP, the programming language that WordPress is built in. I’ll give you an overview of what PHP is and how it’s used for WordPress themes and plugins, with examples. 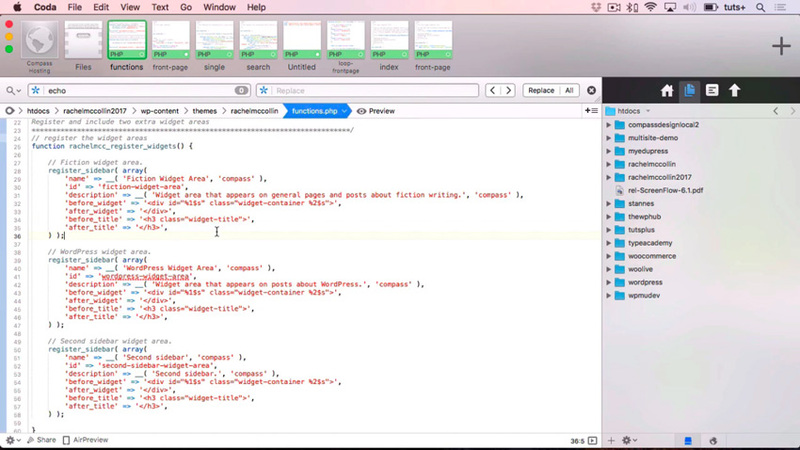 You’ll go on to learn how to create a PHP file and use it to output HTML. Then you’ll learn to use functions, loops and if statements for coding custom WordPress themes and plugins.